A TMasterFrame is a dynamic band frame that can be linked as a "detail frame" to a parent PageFrame or to another TMasterFrame via their DetailFrame property, or executed independently at any point in a report by calling TMasterFrame.Execute(ReportWriter). It provides a single "code loop" to cycle through a "group of rows" in a report, but lacks the fixed band page elements of a TPageFrame. Studying this diagramme and understanding it well can be the key to effectively using a TMasterFrame. 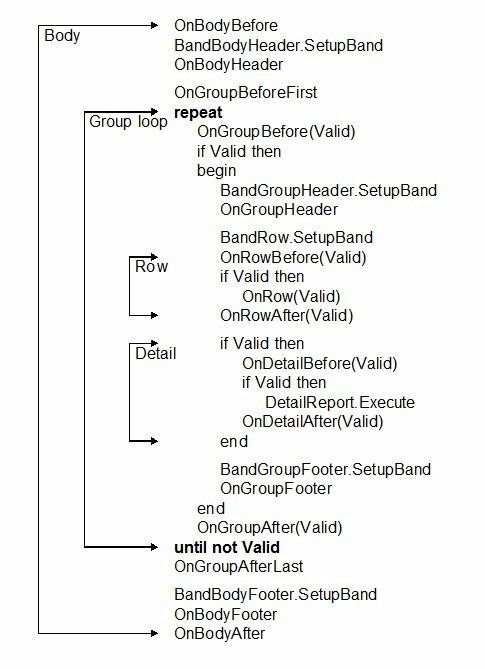 When executed, a TMasterFrame component cycles through a sequence of band output events: OnBodyHeader, OnGroupHeader, OnRow, OnGroupFooter, and OnBodyFooter. These output events are where you write your report output code. Each output event is preceded by a corresponding automatic band setup/definition process where band font and tab settings are applied. It includes a repeated loop which continues to cycle until invalidated in code by setting event parameter Valid := False within the loop. The "Body" output events (OnBodyHeader and OnBodyFooter) start and conclude output of the "dynamic group bands" of the report (the repeated loop part of the frame). The "Group loop" output events cycle in a repeated loop until Valid := False. A group loosely constitutes a single report row and its associated row details (if any). The latter triggers a sub-frame (TMasterFrame or TDetailFrame) linked via the property TMasterFrame.DetailFrame. However, you are not bound by this underlying frame structure and can execute any other frame(s) you wish at any point.